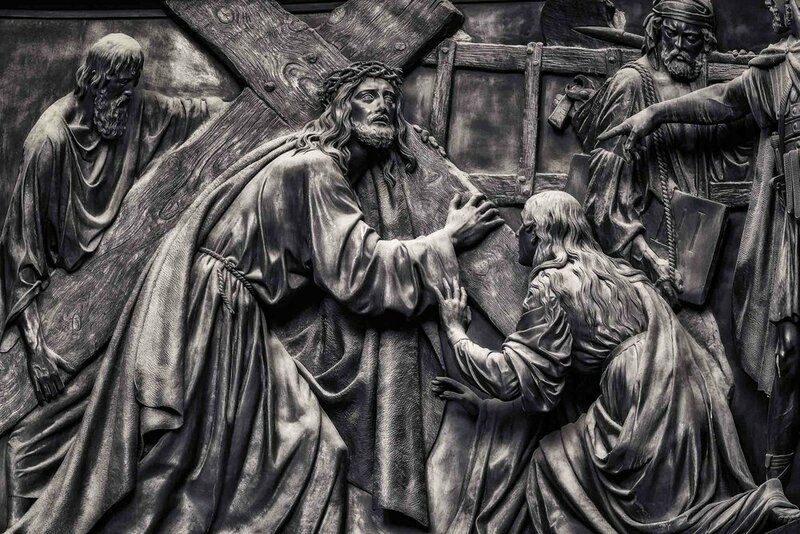 Stunning relief of the road to Calvary on an outside wall of the magnificent St. Isaac's Cathedral in St. Petersburg, Russia. St. Isaacs Cathedral in St. Petersburg Russia is spectacular. I spent several hours photographing the exterior of the building, concentrating particularly on the range of highly detailed sculptures around the buildings outer walls. I often make mention of the importance of and relationship between circles and triangles in people based photography. Needless to say that heads and faces are of a circular shape and their placement within the frame, to form triangles, is a recurring theme in a great deal of art over the centuries. Those triangles are then referenced and further emphasized through the use of diagonal lines throughout the image. In this case you’ll notice the V shape of Jesus’s right arm in the above artwork. That shape is made up of two diagonal lines intersecting with each other. The woman on the right of the frame (Mary Magdalene, I assume) has the same V shape occurring, this time with her left arm. Can you see that the cross is also positioned in a double V shape, with one V at the top and a much larger one at the bottom. Course can be taken up to 6 months after payment has been made. The image is full of triangles. Why don’t you see if you can spot a few more. Just remember they don’t have to be equilateral triangles, nor do they have to be complete. It’s sometimes enough that lines and shapes are suggested, as evidenced in the V shape of several of the arms within the image. And guess what? If you look hard enough you might even find a few more circles. What about the ladder in the photo at the top of this post? I guess it was necessary for the grizzly job to come. But, as far as this particular art work is concerned, I suspect the ladder is there so as to introduce a new shape, that of the rectangle. A highly detailed statue of a warrior-like figure in Palace Square in St. Petersburg, Russia. What about the black and white image of the statue from Palace Square in Moscow? It’s very symmetrical, which is a great way for the artist to bring a sense of order and calmness to an image with so many intricate details. The compositional elements of balance and repetition have also been used very successfully in that statue. I chose a warm tone, black and white rendering of this image to introduce a sense of quiet to what is a very powerful, rigid and, potentially, noisy image. A dramatic view of the dome and statues at St. Isaac's Cathedral in St. Petersburg, Russia. The world is full of amazing things to photograph. Whether it’s wildlife, architecture, landscape or people that attracts your interest it’s worthwhile paying attention to composition when you make your photos. Great lighting and a compelling expression can draw the attention of the viewer. But it’s often the more subtle arrangement of compositional elements like line, shape, texture and color that brings those elements into a harmonious and cohesive arrangement within the frame. If you want to improve your photography beyond a working knowledge of Shutter Speed, Aperture and ISO then I’d recommend learning about composition. It’s fun and good composition can be the defining feature that separates your photos out from the rest of the pack.